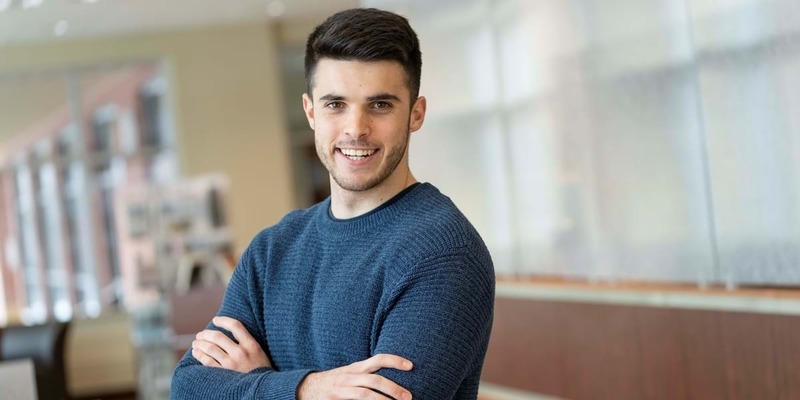 Jacobo is majoring in both finance and management. Following graduation, he plans to get some work experience and then pursue a graduate degree in business. A defender on the Red Raider men’s soccer team, he is also active in Northwestern’s International Club. I decided to attend college in the United States because I wanted to learn more English and experience a different culture. Back in Spain, it’s hard to combine studies with sports at the undergraduate level, so coming here was a great opportunity to pursue my two passions: soccer and business. I chose Northwestern after receiving an offer from the soccer coach. What motivated me to come here is that the college has a very diverse soccer team with highly skilled players, and it offers a strong academic program that includes a wide range of business degrees. Breno Fabbri has been my roommate since our freshman year. We are both international students, so we helped each other adjust to living in a different country and speaking a different language. Breno has become one of my best friends at Northwestern, and I got to visit his home in Brazil during the summer. I came to the U.S. looking for opportunities to learn more about business and grow my faith, and I have found at Northwestern the perfect place to increase my knowledge and become a better Christian. Northwestern provides many career opportunities, like the Chicago Semester, which placed me in a summer internship with a company in Chicago. In most of my classes there are fewer than 25 students, so it’s easy to interact with the professors. They are all very friendly and always willing to help me with any classwork or even personal matters. I can approach my professors after class or stop by their office any time. What I appreciate the most about Orange City is that it is located in a very calm and safe area. People in this community are welcoming and friendly. Despite being a small town, there are fun things to do around campus, and I have plenty of time to hang out with my friends and participate in school activities.